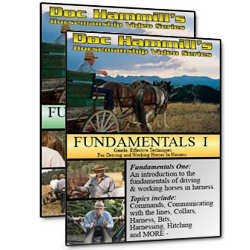 Doc’s DVDs can be purchased in our online store or at any of Doc’s personal appearances. 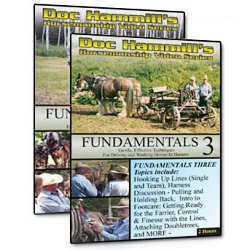 In this set of two DVDs, Doc uses a mule, a saddle horse and draft horses to take you through his 10-step method for gently training horses to drive. 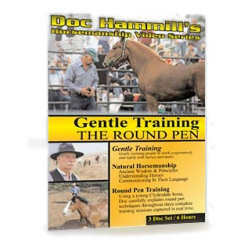 In this set of three DVDs, Doc uses a Clydesdale colt to carefully explain and demonstrate round pen techniques. Three complete training sessions are captured in real time. Daily interaction can and should be more than just feeding and care giving. 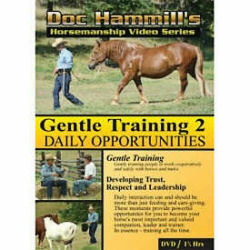 These moments provide powerful opportunities for you to become your horse’s most important and valued companion, leader, and trainer. In essence — training all the time. 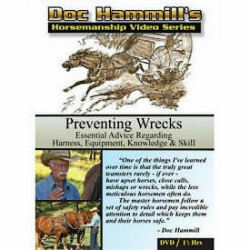 In this DVD, Doc will help you to work cooperatively and safely with your horses or mules. The Horses Can Do It! A delightful half-hour video for young children. Move over dump trucks and other diesel powered equipment! Here come the horses: Barney, Misty, Dillon, Tom, and Ginger! They’re ready for work! Watch the horses plow, make hay. and haul logs and firewood, and MORE! “The Horses Can Do It!” captures the exciting sights and sounds of horses at work, intermixed with music. 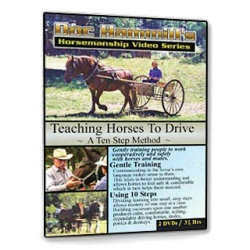 Doc answers questions like, “Do horses sleep?” and “What do horses eat?” It’s sure to have everyone saying, “AGAIN!” Great for ages 2-8, and children of ALL ages!